Shared Interests | My hobbies, recipes, interests and experiences. Perhaps we have something in common? I picked up a copy of Learning Puppet 4 shortly after publication and went through some of the examples and exercises. Pretty straightforward, although there were a few glitches in the examples, as is typical with any fast-moving technology. The book’s errata addressed all of these, as far as I recall. Command: "rsync" "--verbose" "--archive" "--delete" "-z" "--copy-links" "--no-owner" "--no-group" "--rsync-path" "sudo rsync" "-e" "ssh -p 2222 -o LogLevel=FATAL  -o ControlMaster=auto -o ControlPath=/var/folders/6s/_lvgcgf10395112fqhvwlr1hv5_gdx/T/ssh.804 -o ControlPersist=10m  -o IdentitiesOnly=yes -o StrictHostKeyChecking=no -o UserKnownHostsFile=/dev/null -i '/path/to/learning-puppet4/.vagrant/machines/client/virtualbox/private_key'" "--exclude" ".vagrant/" "/path/to/learning-puppet4/" "vagrant@127.0.0.1:/vagrant"
In particular, this plugin helps avoid problems that happen when a new kernel is installed, such as the /vagrant shared mount not being available. Connection to 127.0.0.1 closed by remote host. I’ve restored my original ssh config file, with a new Host section for the learning environment’s virtual machine. I may need to add more Hosts for the other VM’s, but hopefully I’ll remember to check here for hints if I run into this issue again. Here’s a typical oven roasting session. Prep the house by opening several windows, because this will generate quite a bit of smoke! I pre-heat the convection oven to 500 °F (260 °C), the max for our oven. I also have some baking stones in there to help maintain an even temperature. 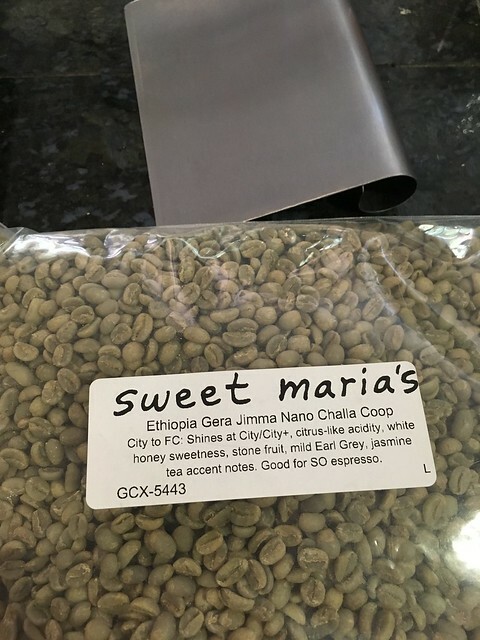 Load a perforated baking sheet (~12 x 18 inch) with about 12 oz (350 g) of green coffee — today I’m roasting Sweet Maria’s GCX-5443, Ethiopia Gera Jimma Nano Challa Co-op, my current favorite for medium-dark roast. 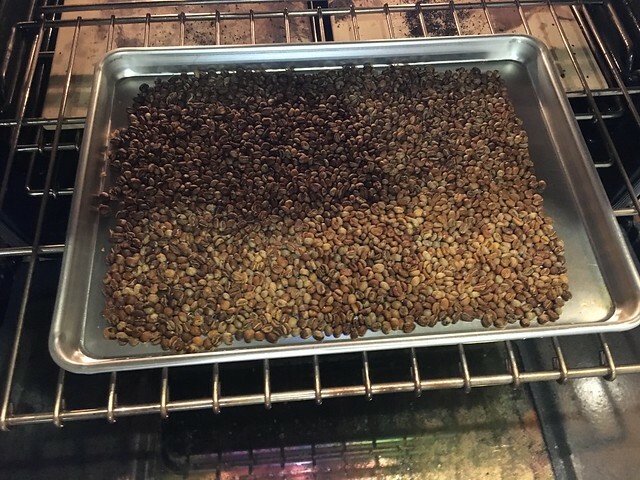 Put the loaded roasting pan into the oven, and listen for “first crack” (when the first coffee bean audibly pops open). Usually that’ll be about 5:00 minutes for me. About a minute later, it’s time to rotate the pan–this helps the coffee roast more evenly. Now comes the hardest part: getting the 500-degree coffee beans from the pan into a colander. Then I take this and another colander outside, and pour the beans from one colander into the other. This helps the beans air-cool quickly, and also releases most of the chaff. 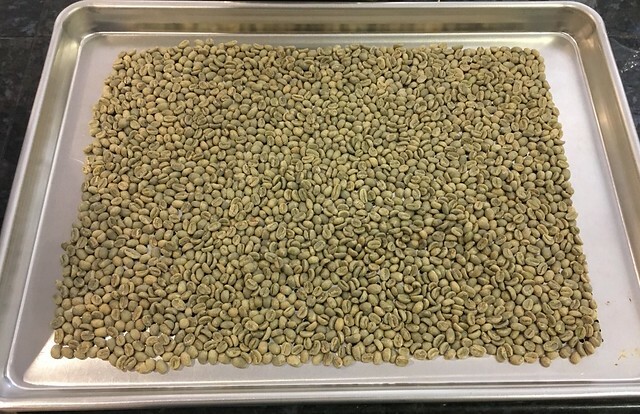 Once the beans are cool enough to touch, I put them into a vented container and let them cool completely. 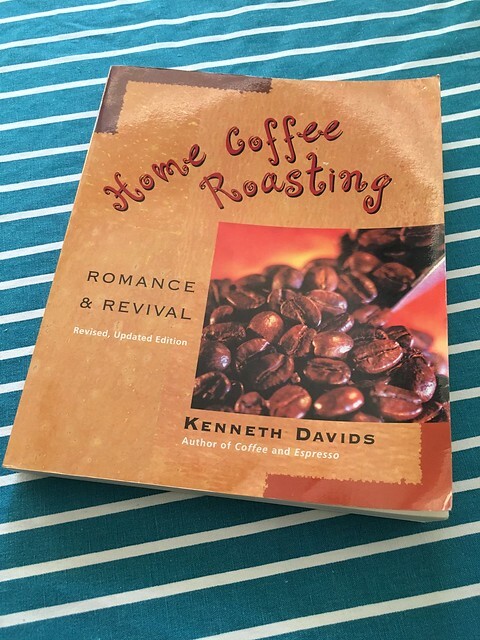 For more information on roasting your own coffee, check out Home Coffee Roasting: Romance and Revival by Kenneth Davids. I haven’t been using my blog lately because I’ve been trying to find a reasonably-priced service that offers encrypted web connections, i.e. https://example.com. A few weeks ago my current hosting provider, Pair, started offering that as a free service. Woot! I’ve now got that set up, including a permanent redirect from http->https. I found redirect-checker to be pretty helpful in validating my redirect rules. I’ve spent some time upgrading my site, which unfortunately broke some of my plugins. I switched to a new recipe plugin, WP Recipe Maker. But I haven’t found a way to use the free version of this tool to import my old recipes automatically. I’ll probably just go through my recipes and reformat them manually. Sounds tedious, but it’ll be a good opportunity to look through them all again. Argh! I did a full scan of my Mac and discovered a virus on the Time Machine volume. I wrote about this a few years ago, and the tweaks to my mail/anti-virus/Time Machine work flow have served me well. But I guess a virus slipped through the cracks somehow, and it’s kind of a pain to eradicate an infected file within the Time Machine software — First problem is the viruses are normally attachments, which are stored within the ~/Library folder, which is normally hidden. Second issue is the Time Machine interface, which (as far as I know) precludes using Spaces and app switching. And finally, the mail attachments are buried deep within the directory tree with somewhat meaningless path names. But it finally occurred to me to copy the offending path from the antivirus log file then go into Time Machine and paste it into the search bar. After that, it’s just a matter of scrolling back in time until you find the most recent backup with the infected file. If the file is from a really old TM backup, just take a look at the backup date/time in the path from the antivirus log to home in on it within Time Machine. (Assuming you didn’t rename either the TimeMachine or ‘Macintosh HD’ volume names.) Copy the elements of the path following your username. Then start the Time Machine app. Go to the search bar (top right of the TM Finder window) and enter ‘~/’ and paste in the path you copied from the antivirus log. Scroll back to a backup in which that file exists. (You can zoom in on the correct time frame based on the date/time shown in the full path from the antivirus log.) Once you find any copy of the file in Time Machine, select the “Delete all copies of Such-and-Such file” from the action menu. I recently backed the ISS Above wearable project on Kickstarter, which got me thinking about (and tinkering with) my first ISS Above. What is it? Just a super-cool little widget that you can build on top of a Raspberry Pi which will notify you when the International Space Station is about to pass over your location. Unfortunately, when I tried to update my ISS Above, I wasn’t able to successfully write to the old SD card in my RasPi. Not the first SD card that I’ve roached, and I have most of the data from the old card. So I thought I would take this problem opportunity to write up the steps I use to [re-]build an ISS Above gizmo using my Mac. Raspberry Pi computer, complete with 8 GB SD card, power, and case. As far as I know, any model of RasPi will work. One of the supported display options. I’m using the PiGlow in this case. An SD card writer/reader. I like the itty bitty one that AdaFruit sells. The ISS-Above code. I have the HD version, which allows the Pi to show live video from the ISS. Pi Filler app, from Ivan’s RasPi site. While you’re there, grab Pi Copier and Pi Finder. DON’T plug in the SD card/writer yet. You’ll be prompted for that in a moment. 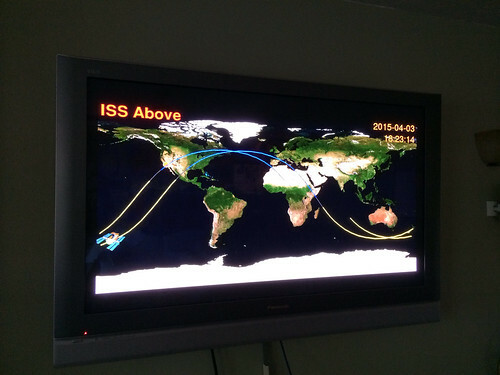 Get the ISS Above image (unzipped) onto the Mac. I had trouble unzipping on OSX, so instead of fixing whatever the problem was, I took the easy way out and unzipped on a PC. Launch the Pi Filler app to write the ISS Above image to an 8 GB SD card. It will prompt you for your ISS Above image file, (e.g. ~/Downloads/issaboveV2015-10-02-14-MASTER.img), and tell you when to insert the SD card/writer. This will take a while, possibly up to half an hour depending on all of your hardware. It took about 10 minutes on my system. I’m pretty sure the Pi Filler unmounts the SD card when finished. Insert the freshly-written SD card into your Pi, hook up your network cable, and power it up! Wait about 30 seconds for the Pi to finish booting. (Optional — If you don’t know how to set up DHCP addresses on your network, skip this step.) Fire up Ivan’s Pi Finder app. This has a handy “Copy MAC address” button. Configure your new wired DHCP address (and restart the DHCP server if necessary), then reboot your Pi to pick up the new address. Plug in the wifi dongle. Be sure to leave the wired network connected for the time being. Set up the new ISS-Above appliance where you’d like it to live. Ideally, this will be some place where the Pi itself is visible (so people will notice the blinking PiGlow), with an HDMI display within reach for a graphical display. Power it up and wait for the ISS to pass overhead! I’ve got this up and running for now, but there are some things I’d like to fix. For one thing, the instructions above could be more streamlined. (I just wrote everything down as I did it.) Also, I haven’t got the live feed from the ISS set up. But those tweaks can be done later. Right now, I’m going to keep an eye on the next pass of the ISS, practically right over my house! Let’s Make something at Hacker Lab! Earlier this month I became one of the Facilitators at Hacker Lab in Sacramento. As such, I’ll be working in the Maker Space once or twice a week, helping users with the plethora of tools and equipment they have available. One of the first tasks assigned to new Facilitators is writing up a short bio. Currently I’m working every Wednesday evening, after I finish my day job. I also plan to work a shift every 2-3 weekends starting next month. Come on out to Midtown (I Street at 17th), and let’s Make something at Hacker Lab! The 2012 Thanksgiving issue of Bon Appétit had a cranberry-orange-mint relish recipe that looked pretty good, except that my wife can’t stand mint. So I left out the mint, substituted satsumas for the oranges, and used star thistle honey instead of sugar. I like to let this sit in the refrigerator overnight to allow all the flavors to meld. 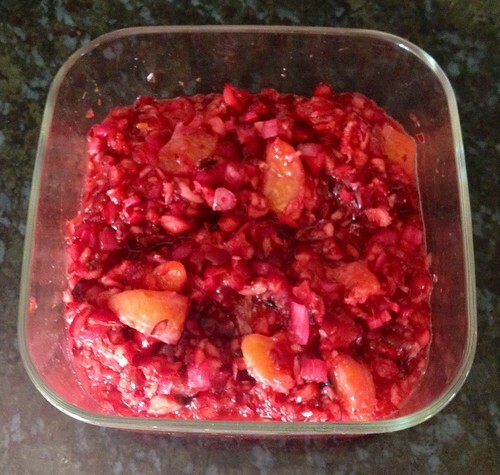 It makes a refreshingly tart complement to many meals, not just Thanksgiving. When I started the [30-day challenge][zero-to-hero] earlier this month, I knew one of the urgent things that needed to be done was a full update of the blog software, theme, and plug-ins. I finally got it done! WordPress is up-to-date, along with the [twentyten] theme and all my active plug-ins. I also took this opportunity to delete old themes and plug-ins that are obsolete, stale, or unlikely to be used. When I updated the twentyten theme, I was expecting to see a widget for images in my admin panel. After all, the Zero-to-Hero post links to an [image widget] page which makes it seem like that’s a regular feature. Or maybe it’s only applicable to a [wordpress.com] hosted site? Anyway, I wanted to add a zero-to-hero badge/widget, and since there doesn’t seem to be one built in I’m trying out [Image-widget] and [Simple-image-widget]. * recipe support, maybe [Easy Recipe]? I’ve uploaded all of those, but I still have to activate and test them, including making sure they don’t interfere with each other! I’ve been playing with Arduino boards for the past year or two. These were designed as micro controllers for the masses — easy to program and simple to wire up. You need only the most rudimentary computer and electronics skills to get started playing with these excellent boards. They’re also relatively inexpensive. You can get an Arduino Uno board, (the most commonly mentioned Arduino in 2013), for about US$30. But if you decide to start using these for real, i.e. deploying a prototype permanently or long-term, suddenly “relatively cheap” may not be quite as inexpensive as you’d like. Thirty bucks is reasonable for something that sits on your workbench, but that’s kind of expensive if you want to use a handful of them to monitor the temperature throughout your house: $30 x 5 is $150, which suddenly isn’t looking inexpensive at all. There are cheaper alternatives, especially if all you need is a few I/O pins. The two that I’ve been playing with lately are Digistump’s Digispark and Adafruit’s Trinket. Both of these are priced under US$10 and use the ATtiny85 micro controller chip, the diminutive little brother of the chip in a regular Arduino. Trinket is a bit cheaper (about $1) than Digispark. Digispark exposes all 6 GPIO pins, whereas Trinket has 5. Digispark supports “shields” (add-on boards) and currently offers ~20 shields. Trinket is available in both 3.3V and 5V, Digistump is 5V only. Digispark is smaller, but Trinket has mounting holes. In general, I prefer the Trinket unless I need all 6 GPIO’s or the slightly smaller form factor of the Digispark. The Digispark shields can also be handy, but I only use those on workbench prototypes. The Trinket tutorial has a wealth of information. Below are some of the things that I’m always looking up there. GPIO output is 20 mA max, same as a regular Arduino. I2C pins are GPIO #0 (I2C data) and GPIO #2 (I2C clock). USB communication uses pins #3 and #4. Hardware on these pins can interfere with the USB interface, e.g. reprogramming the Trinket. So it’s a good idea to provide some sort of disconnect ability if you use either of these two pins. PWM output available on pins #0, #1, and #4. ADC (analog input) pins are GPIO #2, #3, and #4. Keep in mind that the GPIO/digital pin numbers are ”’not”’ the same as the analog inputs! The printed labels on the Trinket are the ”digital” pin numbers.